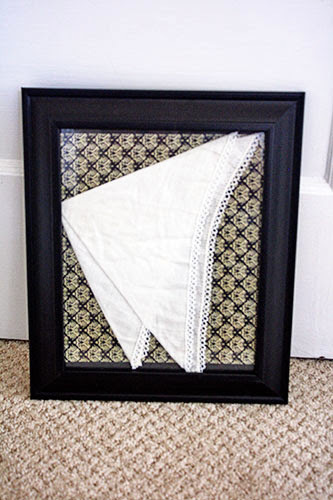 Yesterday I showed you my latest piece of framed personal “art”, but I left you hanging as to where exactly I put it. Truth be told, I actually didn’t hang the frame on the wall. I did, however, place it on a newly-hung shelf. 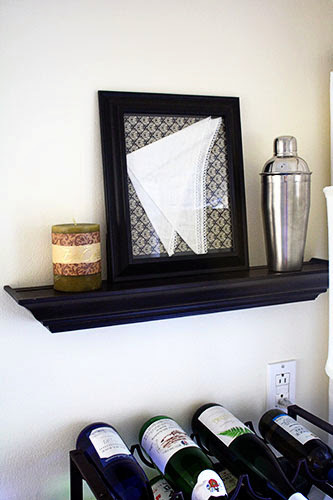 Those readers who follow the precise location of each décor item in our home (i.e. 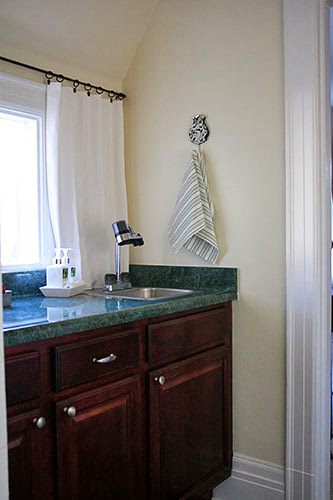 no one) might realize that wood ledge was originally purchased and hung when I redecorated our guest bathroom in the old house. So... yes, it once hung over a toilet. But no worries! It’s been cleaned! Promise! As for the other items on the shelf... I just sorta threw them up there. The candle’s been hidden away in a drawer since we moved in, and lately I’ve been in a use-it-or-lose-it mindset about décor in drawers. It’s at least an improvement over the blank wall! Yup. 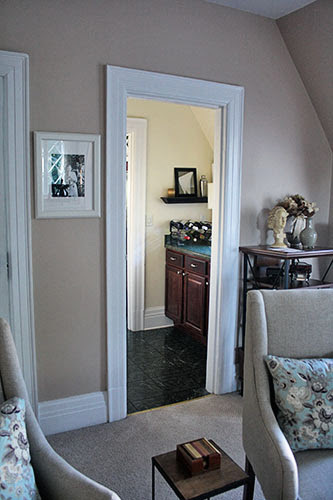 More butler’s pantry sprucing! 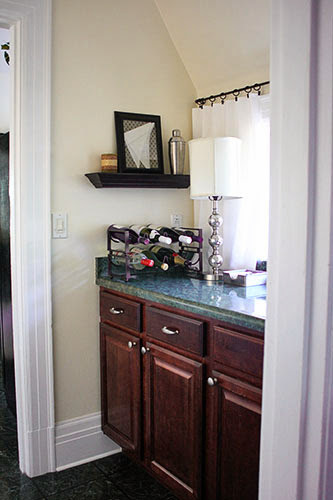 I’m doing what I can to make it more than the counter-in-a-hallway-where-I-kept-my-wine that it was for the first year we lived here. I recently told you (in this post) about making the curtains and replacing the lamp, and now I’m finishing up this little sprucing project. New dish towels! Which I ironed because I am a little crazy like that and also I love ironing! You may recall that I banished the red from our kitchen here in the apartment, Whereas red + delightful pale green in the old house = awesome, red + DARK GREEN EVERYWHERE in this apartment = 1990s Christmastime year-round. 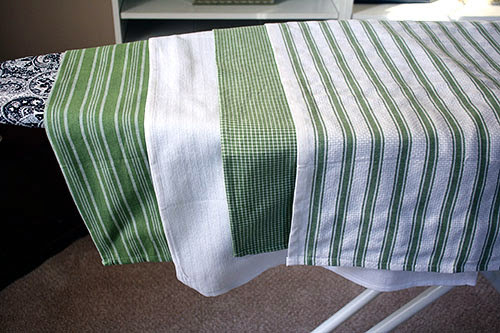 Unfortunately a lot of my dish towels were red or black patterned, and the two green-and-white I had were getting worn. So, I picked up this pack of towels at HomeGoods (I think it was $6 for the set of four) to keep the green-or-neutrals-only theme rolling. In lieu of an actual towel rack, I instead hung an old mirrored coat hook on the wall for a place to hang the towel. The hook, like the candle, had been hidden away, so high-five for finally getting these items out of storage. Soap! 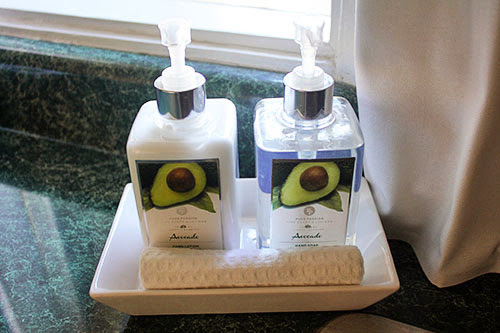 I finally, FINALLY retired that ancient plastic soap dispenser in favor of this pretty set from HomeGoods. I found it in the kitchen department, and this set of soap and lotion WITH dish AND mini-towel cost the same as a single empty dispenser – seven bucks. And the best part? AVOCADO SCENT. You better believe I lotion my hands frequently when passing through this room. It has meaningful art, it has function. And it has wine. Good enough for me.